Drama starring Mai Zetterling and Robert Beatty. An army officer on leave sees a portrait of a beautiful young girl in a London art gallery. When another visitor to the gallery identifies the girl as his lost daughter, the officer is intrigued and, on his return to Germany, decides to go in search of the girl. Best known for its costume dramas, Gainsborough was also capable of turning out some pretty decent contemporary pictures. 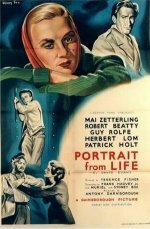 Originally titled The Girl in the Painting, Terence Fisher's film tackles the then thorny topic of rehabilitating Nazi sympathisers within postwar German society. The cast is first rate, with Mai Zetterling particularly good as the amnesiac forced to explore her association with a high-ranking fascist. However, the dramatic demands of a reconciliation with her father and a romance with Robert Beatty soon swamp the infinitely more fascinating background story and a good opportunity for some serious social comment goes begging.